As you’re probably aware, it’s good practice to have a Balun where BAL(anced) meets UN(balanced) feeder and the following is my latest accessory for when I’m operating “Portable“. 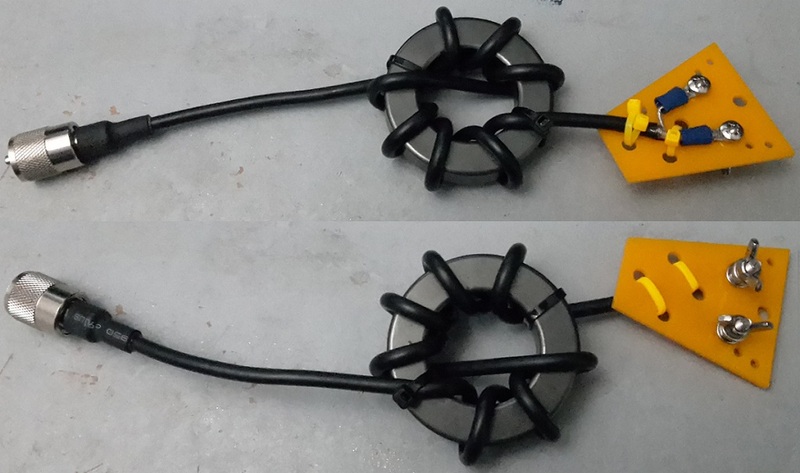 This is a very simple 1:1 Choke Balun made from a PL259, some RG58, an FT240-31 ferrite toroid plus one of my Ham Goodies Dipole Centres. The PL259 plugs into a radio or ATU and the balanced feeder attaches to the M4 bolts on the yellow centre. This also saves using a boxed version which introduces another PL259/SO239 combo – the RG58 coax is kept deliberately short as this is, essentially, balanced line to the Shack. 8 turns form a resistive choke from 3.5MHz on this 31-mix material. Using the slightly cheaper 43-mix material would raise this to around 5MHz. Essentially, it’s just like any standard coaxial choke that you usually get “inside a box”, but this version makes connections a little easier, not to mention cheaper: Around £12 of parts if you omit the plastic fitting and go with a pair of standard power-supply terminals.